This post is presented by Della Rice. I am first generation American in an all Jamaican family. People from the Caribbean practically bathe in rice on a daily basis. So when I was presented with the opportunity to create a stir with my own Rice bowls using Della Rice I didn’t hesitate! As a Della Rice Ambassador, the wonderful people at Della Rice were awesome enough to send me a box full of their flavorful rice. I had a hard time choosing which rice to use but I was in the mood for a flavor explosion so I chose the Jasmine Rice with Roasted Garlic. When I opened the bag I was immediately drawn to the smell. I had never smelled such an amazing flavor in uncooked rice! I even had the hubby smell it and he was sold. I decided to create a Steak Veggie and Avocado Rice Bowl because… well don’t those ingredients sound amazing together?! My hubby wasn’t in the mood for steak so he added grilled chicken instead! Truth be told you don’t have to add meat at all, this could easily be a veggies and avocado rice bowl on its own because the rice is the main star! Steak or chicken is optional. Season meat with usual blend, mine is below. Prepare to your liking. 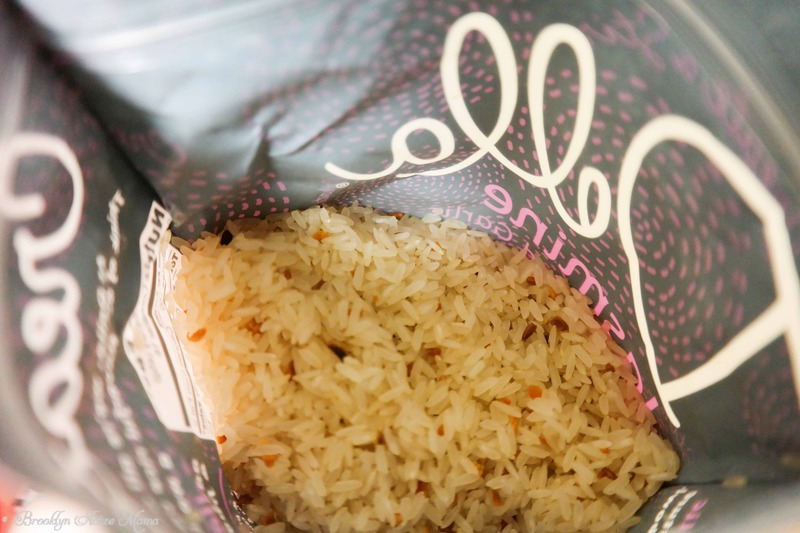 Cook Della Rice according to package directions. While rice is cooking (20 minutes), prepare vegetables. Sautee the green peppers, red peppers and onion over a low heat until tender. Keep avocado and tomato on the side. Place rice in bowl, top with green peppers, red peppers and onion in the middle. Place the sliced avocado in a circular formation around the vegetables. Top with diced tomato and a sprinkle of Mexican blend shredded cheese. You can win one of these amazing rice cookers that cooks both white and brown rice, steam vegetables and so much more by entering the giveaway below. There will be 50 winners! Don’t forget you can connect with Della Rice on Social Media and check out the TONS of other creative rice bowls under the #createastir hashtag! What is your favorite rice bowl? What should I try next?? Have you ever had rice with roasted garlic? Della Rice Ambassador + Fitbloggin + A Newborn YouTuber! THIS WOULD BE MY FAVVVVE RICEBOWL. CARLA recently posted…I don’t believe in writer’s block. Mmm! This looks delicious! I used to make a Japanese-style salmon rice bowl but I haven’t made it in years! I love rice it’s a staple where I am from.I can eat it by itself that’s how bad it is. I am just now getting into the avocado craze I had it on a salad the other day….good gawd. Yum – this looks awesome!! I always get the steak burrito bowl at Chipotle and this is similar!!! Kim recently posted…One Size Does NOT Fit All!! Mmmmm! I’m positive my husband would enjoy this. And I have to give you kudos for using the term “julienne”. Yum, yum, yum! When can I come over for dinner? My sister makes what she calls “power bowls” which are just a lot of goodness and healthy foods in one bowl. I’m in! Tamara recently posted…Let’s Go Shooting Together. This looks delicious! I love rice bowls! The packaging is pretty too! We are definitely garlic lovers in my house, so this flavor would be a fan favorite. Pre-seasoned rice sounds great! Definitely a great a time-saver. I usually am not a fan of plain cooked rice so I do something throw in some minced garlic if I have extra time.